Meanwhile, if the phosphate industry has its way, it may soon be distributing another of its by-products to communities across the country. That waste product is radium, which may soon be added to a roadbed near you – if the EPA buckles and industry has its way. Central Florida knows it well. So too does Garrison Montana, Cubatao Brazil, and any other community where phosphate industries have had inefficient, or non-existent, pollution control: Fluoride. When this ore is processed into water-soluble phosphate (via the addition of sulfuric acid), the fluoride content of the ore is vaporized into the air, forming highly toxic gaseous compounds (hydrogen fluoride and silicon tetrafluoride). In the past, when the industry had little, if any, pollution control, the fluoride gases were frequently emitted in large volumes into surrounding communities, causing serious environmental damage. 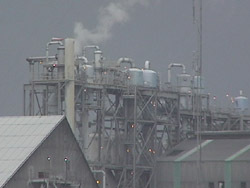 In the 1960s, air pollution emitted by another phosphate plant in Garrison, Montana was severe enough to be branded “the worst in the nation” by a 1967 National Air Pollution Conference in Washington, D.C.
Damage to vegetation and livestock, caused by fluoride emissions from large industry, has resulted, as one might expect, in a great deal of expensive litigation. In 1983, Dr. Leonard Weinstein of Cornell University, stated that “certainly, there has been more litigation on alleged damage to agriculture by fluoride than all other pollutants combined” (Weinstein 1983). While Weinstein was referring to fluoride pollution in general, his comments give an indication of the problem facing the phosphate industry – one of the most notorious emitters of fluoride – in its early days. “Airborne fluorides have caused more worldwide damage to domestic animals than any other air pollutant” (Lillie 1970). “Air pollution damage to agricultural production in the United States in 1967 was estimated at $500,000,000. Fluoride damage to livestock and vegetation was a substantial part of this amount” (Shupe 1970). 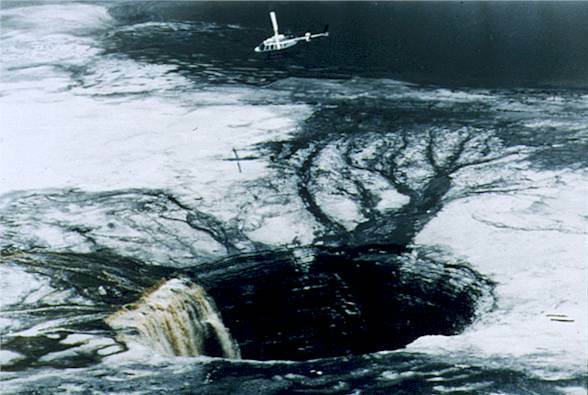 “The fluorine compounds liberated during the acidulation of phosphate rock are now rightly regarded as a menace and the industry is now obliged to suppress emissions-containing vapors to within very low limits in most parts of the world… In the past, little attention was paid to the emission of gaseous fluorine compounds in the fertilizer industry. But today fluorine recovery is increasingly necessary because of stringent environmental restrictions which demand drastic reductions in the quantities of volatile and toxic fluorine compounds emitted into the waste gases. These compounds now have to be recovered and converted into harmless by-products for disposal or, more desirably, into marketable products” (Denzinger 1979). Considering the great demand among big industry for fluoride chemicals as a material used in a wide variety of commercial products and industrial processes, the phosphate industry could have made quite a handsome profit selling its fluoride wastes to industry. This was indeed the hope among some industry analysts, including the authors of the review noted above (Denzinger 1979). However, the US phosphate industry has thus far been unable to take advantage of this market. The principal reason for this failure stems from the fact that fluoride captured in the scrubbers is combined with silica. The resulting silicofluoride complex has, in turn, proved difficult for the industry to separate and purify in an economically-viable process. Of course, not all of the phosphate industry’s fluoride waste is disposed of in the ponds. As noted earlier, the phosphate industry has found at least one regular consumer of its silicofluorides: municipal water-treatment facilities. 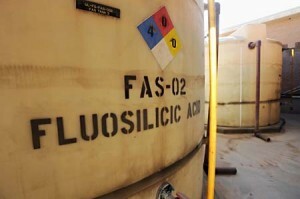 According to recent estimates, the phosphate industry sells approximately 200,000 tons of silicofluorides (hydrofluorosilicic acid & sodium silicofluoride) to US communities each year for use as a water fluoridation agent (Coplan & Masters 2001). 6. Fluoridation: “An ideal solution to a long-standing problem”? Adding to Hirzy’s, and the EPA Union’s, concerns are three recent findings. First and foremost are two recent studies reporting a relationship between water treated with silicofluorides and elevated levels of lead in children’s blood (Masters & Coplan 1999, 2000). The authors of these studies speculate that the silicofluoride complex may increase the uptake of lead (derived from other environmental sources, such as lead paint) into the bloodstream. The second finding is the recent, and quite remarkable concession from the EPA, that despite 50 years of water fluoridation, the EPA has no chronic health studies on silicofluorides. All safety studies on fluoride to date have been conducted using pharmaceutical-grade sodium fluoride, not industrial-grade silicofluorides. A similar concession has also been obtained from the respective authorities in England. The defense made by agencies promoting water fluoridation, such as the US Centers for Disease Control, to the lack of such studies, is that when the silicofluoride complex is diluted into water, it dissociates into free fluoride ions or other fluoride compounds (e.g. aluminum-fluoride), and thus the treated water, when consumed, will have no remaining silicofluoride residues (Urbansky & Schock, 2000). This argument, while supported by a good deal of theoretical calculation is at odds with a recently obtained and translated PhD dissertation from a German chemist. (Westendorf 1975). According to the dissertation, not only do the silicofluorides not fully dissociate, the remaining silicofluoride complexes could be more potent inhibitors of cholinesterase, an enzyme vital to the functioning of the central nervous system. The third finding is that the silicofluorides, as obtained from the scrubbers of the phosphate industry, contain a wide variety of impurities present in the process water – particularly arsenic and possibly radionuclides. While these impurities occur at low concentrations, especially after dilution into the water, their purposeful addition to water supplies directly violates EPA public health goals. For instance, the EPA’s Maximum Contaminant Level Goal for arsenic, a known human carcinogen, is 0 parts per billion. However, according to the National Sanitation Foundation, the addition of silicofluorides to the water supply will add, on average, about 0.1 to 0.43 ppb, and as much as 1.6 ppb, arsenic to the water. Fluoride contaminated wastewater sitting on top of “gypsum stack.”To make 1 pound of commercial fertilizer, the phosphate industry creates 5 pounds of contaminated phosphogypsum slurry (calcium sulfate). This slurry is piped from the processing facilities up into the acidic wastewater ponds that sit atop the mountainous waste piles known as gypsum stacks. It is sort of a misnomer, however, to call these stacks “gypsum” stacks. Indeed, if the stacks were simply gypsum, they probably wouldn’t exist, as gypsum can be readily sold for various purposes (e.g. as a building material). What can’t be readily sold, however, is radioactive gypsum, which is about the only type of gypsum the phosphate industry has to offer. While uranium, and its decay-products, naturally occur in phosphate ore, their concentrations in the gypsum waste, after the extraction of soluble phosphate, are up to 60 times greater. Thus, according to US News & World Report, the EPA is currently “weighing whether to classify the gypsum stacks as hazardous waste under federal statutes, which would force the industry to provide strict safeguards” (to nearly 1 billion tons of waste). 10. Will radioactive gypsum be added to roads? In an interesting parallel to fluoride, the phosphate industry is looking to turn its gypsum waste into a marketable product: as a potential cover for landfills, as a soil conditioner, and as a base material for roads. While the presence of uranium decay-products makes gypsum a tough sell for the phosphate industry, the uranium has, at various times, presented the industry with a business opportunity of its own. One of the lesser-known-facts about the phosphate industry is that its processing facilities have produced and sold sizeable quantities of uranium. 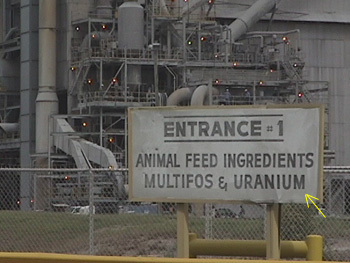 In 1997, just two phosphate plants in Louisiana produced 950,000 pounds of commercial uranium, which amounted to roughly 16% of the domestically produced uranium in the US. 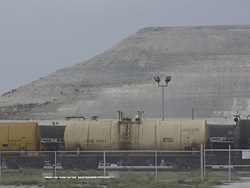 In 1998, the same two plants produced another 950,000 pounds, but due to declining market prices for uranium, both plants have since ceased production. The Department of Energy has not always been so open about the uranium-making potential of the phosphate industry. During the Cold War, its predecessor institution, the Atomic Energy Commission (AEC), kept this fact closely under wraps – even to the workers who were, unknowingly, handling large quantities of the radioactive material. In Joliet, Illinois, it has only recently come to light that the local phosphate plant had secretly produced some 2 million pounds of uranium for the US government in the years 1952 to 1962. According to local newspaper reports, the cancer rates of people who worked at the plant, especially “Building 55” where the uranium was processed, are unusually high. “We used to kind of joke that if you worked for Blockson, you got cancer,” quipped Vince Driscoll, the son of a cancer-stricken worker. While the radioactivity of the gypsum stacks has probably been the key health concern of the EPA, it is not the only one. 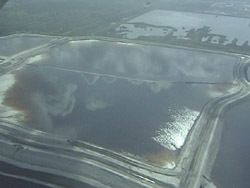 Today, the same gypsum stack which caused this particular spill, is considered by Florida’s Department of Environmental Protection to be “the most serious pollution threat in the state.” That’s because tropical rains over the past couple of years have brought the wastewater to the edge of the stack’s walls. To prevent such a spill, which was all but inevitable, the EPA recently agreed to let Florida pursue “Option Z“: To load 500-600 million gallons of the wastewater onto barges and dump it directly into the Gulf of Mexico. The dumping of the wastewater into the Gulf represents the latest in a series of high-profile embarrasments for Florida’s phosphate industry; one of the most dramatic of which happened on June 15, 1994. Photographs of the Photographs of the phosphate industry are available here. Bellack E, Baker RJ. (1970). Fluoridation chemicals – the supply picture. Journal of the American Water Works Association 62: 223-224. Coplan MJ, Masters RD. (2001). Silicofluorides and fluoridation. Fluoride 34(3): 161-220. Denzinger HF, et al. (1979). Fluorine recovery in the fertilizer industry – a review. Phosphorus & Potassium Sept/Oct: 33-39. Ender F. (1969). “The effect of air pollution on animals.” pp. 245-254. In: Air Pollution – Proceedings of the First European Congress on the Influence of Air Pollution on Plants and Animals, Wageningen, April 22 to 27, 1968. Centre for Agricultural Publishing & Documentation, Wageningen. Hirzy JW. (2000). Video-taped interview with Dr. J. William Hirzy, Senior Vice President, EPA Headquarters Union. Interview by Michael Connett. July 3. Hodge HC, Smith FA. (1977). Occupational fluoride exposure. Journal of Occupational Medicine 19: 12-39. Lillie RJ. (1970). Air Pollutants Affecting the Performance of Domestic Animals: A Literature Review. U.S. Dept. of Agriculture. Agricultural Handbook No. 380. Washington D.C.
Masters R, et al. (2000). Association of Silicofluoride Treated Water with Elevated Blood Lead. Neurotoxicology 21(6): 1091-1099. Shupe JL. (1970). Fluorine toxicosis and industry. American Industrial Hygiene Association Journal 31: 240-247. Urbansky ET, Schock MR. (2000). Can Fluoridation Affect Water Lead(II) Levels and Lead(II) Neurotoxicity? United States Environmental Protection Agency (EPA), Office of Research and Development, National Risk Management Research Laboratory, Water Supply and Water Resources Division, Cincinnati, Ohio. Weinstein LH. (1983). “Effects of Fluorides on Plants and Plant Communities: An Overview.” pp. 53-59. In: Shupe JL, Peterson HB, Leone NC, (Eds). Fluorides: Effects on Vegetation, Animals, and Humans. Paragon Press. Salt Lake City, Utah. Westendorf J. (1975). The kinetics of acetylcholinesterase inhibition and the influence of fluoride and fluoride complexes on the permeability of erythrocyte membranes. Ph.D. Dissertation in Chemistry, University of Hamburg, Germany.